To design reusable, decorative gift tins for Solly's Choice's wildflower seed line. 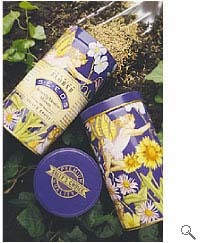 A whimsical sun-cherub floating through a patch of summer flowers is designed on a tin with a peel-away label, leaving the consumer with a beautiful reusable tin. The lid retains a subtle brand signature.